Brand new Galaxy S4 "broken" for no reason. So today I was on the phone with my ma. I put the phone down on my car seat and turned on my car, but then i realized i need to get directions somewhere. So I picked up my wonderful S4 and lo-and-behold, the screen wont turn on, or it turns on slightly but its all blurry and flashing. I happen to be right near a ATT store so I shoot right over. What do these people tell me? Oh its a pressure crack. You must have dropped it or pressed on it. I said no, i was using it and put it down like a normal person and when i picked it back up it was broken. I didn't do anything to it. They said, well i can see right here its obviously a pressure crack and we can't replace it because you dont have insurance on it, you are gona have to buy a new one. 3) it was fully-functioning one second and then broken the next. No dropping or pressing happened. WHAT THE HECK??? How the heck does a 300 dollar phone break like that for no reason. Am I the only person that thinks this is insane? Does anyone know of any way I can get a new one with out paying another 300-600 dollars for this piece of crap? I'm sorry I'm so frustrated right now, but I'm a friggin student. I don't have much but this thing has my life on it. What do these people think, its okay to rip off kids and their parents who are saving all their money trying to get thru school? "oops the flimsy material we made this crap with broke but its your problem now SORRY!" Sorry, i'm really upset. this is crazy. does anyone have any advise? I'm sorry, do you mean I should call samsung directly? So I called Samsung and they said they would let me send it in for free to evaluate it and if they find that the problem was due to a defect they will repair it for free, but if they find it was due to some physical damage then I'll have to pay to fix it. is this a good idea? Should I send it in? could you take a picture of it if you got a camera? Ill let you know if it's a pressure crack or not. Generally speaking pressure cracks only affect part of the screen. If they said it's a pressure crack then there must appear to be a point of contact somewhere on the screen. I have to say after seeing multiple reports of random internal display cracking on the S4 I am inclined to believe you, here is the problem. I worked in wireless for several years and any time we came across a screen that appeared to have internal impact it was always considered damage. Unless the display is completely black with no impact spots, you are pretty much out of luck. Moving forward I would definitely recommend getting insurance on a 600 dollar device. Some people see no point in it but unless you have the extra cash to replace your device at any given time, the insurance is good to have. Sent from my Google Play Edition HTC ONE. Could some impact have happened before, but the final crack appear only later on? Was is hot outside and cold inside the car? Maybe a sudden change of temperature completed some damage that wasn't yet apparent? Just to comfort you: that phone costs US$1200 where I live. I got it with a big discount for $800. And suggestion: a completely hard case won't help much, as impact is not absorbed. Try something like an Otterbox. its definitely hot out here, but my car wasn't super cold or anything. it is possible that it was in my purse and banged into something else at some point, but i thought having a friggin' case and screen protecter would prevent that kind of damage. what the heck is the point of the screen protector then? why don't they tell you these things are so dang sensitive? do you guys think i should send it in to samsung? they are offering to look at it for free...although, now that I've read your posts, i feel like they are probably going to say it was my fault and i have to pay for the repair. jeeze what a bummer..
@michaelBR where are you that this phone costs you double? Shiesh! PS I will def get a better case AND insurance in the future. i just cant believe the "best" phone out right now could be so friggin flimsy. yea, the picture i posted didn't work. I don't know how to do this. lol sorry guys. sorry for posting a million times. thanks again for all your advise. please let me know if you think its worth it to send it in to samsung. BR is for Brazil. While lots of things can be cheaper, many others aren't. Cell phones and services,cars, and electronics in general are pretty expensive. Too many taxes, basically. Yeah if it's like the picture you showed but only the corner is visible: definitely a pressure crack on the inside usually the matrix itself. Contrary to it's term these cracks can come up from overheating, not just pressure albeit with heat it's usually a circular blob not really straight jagged edges. Can't say how much it would take for a smartphone. They do warn you, look at the manuals it gives you operating temperatures. For your advice: never leave electronics, batteries, or chemicals out in the sun, inside your car or not. A few minutes can easily push a smartphone to over 140f with ease. By the picture it is definitely a busted matrix in the inside. I think that this time your best option would be to send it to Samsung unless you find a local store that would replace the inside for you. In any case I am sure it will be cheaper than buying a new one. I don't know where you are located but this place have different stores through out the US... iPhone Repair, Smartphone Repair, Computer Repair : uBreakiFix .....check it out. 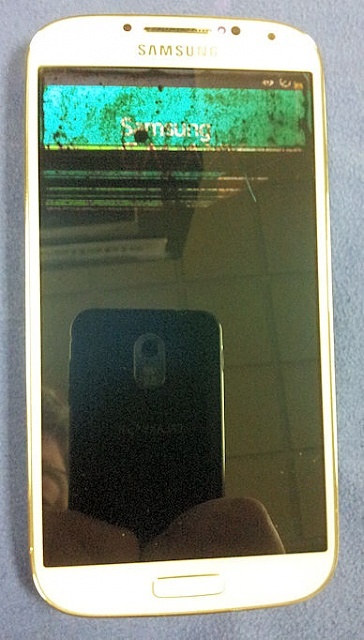 Thank you very much for this post, now I have one more evidence of the "Galaxy S4 Mysterious Display Failure". My daughter bought new S4 two weeks ago and one week later the screen failed. She was using it during the night and before she went to sleep she plugged it to the charger and putted the phone on the bedside table. When she woke up in the morning the screen was dead and she noticed hairline crack on the screen (behind the front glass). No drop, no pressure! Now the local repair center declines to fix it as warranty, we shall pay $250 for the repair... They say "there is no visible damage caused by dropping the phone so this should be caused by pressure like if you put it in your rear pocket and sit on it"! I'm now fighting against them, my theory is this has been caused by heat, as the phone did heat a lot and the battery did only last for about 2 hours if using for browsing or simple games (she had already complained about this to the phone company where she bought the phone). I have found many similar issues, searching the internet, two are most interesting, one is posted from guy working testing new technologies (guy in his position would barely post something like this if not true), the other is regarding the old "S1" and as far as I have found out this issue seems have been all the generations (perhaps not S2). Please notice all the comments! Bottom line, I urge you to send the phone to Samsung for evaluation including the links I have posted and if the results will be negative you should tell them your next action will be lawsuit. This *EXACT* same thing happened to me. I have a Samsung Galaxy S 4 (SCH-R970) from U S Cellular that is just over three weeks old. Never dropped. Not a scratch, dent, ding, chip, etc on it. Last night I left work and placed my phone face down on the passenger seat of my car. Before pulling out of my parking spot I received a text message, so I picked up the phone to check the message and only a .75 inch wide bar across the top would display. Upon close inspection I saw small cracks in the underlying OLED matrix next to the power button. There were no breaks, cracks, scratches or dents in the glass covering the display. Nothing struck the phone and it did not move on the passenger seat after I set it down. The car was never moved, so it could not have been jostled, bumped, or slid off the seat by the motion of the car. I literally placed it on the seat and picked it up a minute later. U.S. Cellular and Samsung are both saying that it is physical damage not covered by warranty. Whether or not it is covered by warranty is not the purpose of my post. There is very clearly an engineering design flaw in the Samsung Galaxy S 4. There is no reason a device should physically break internally with no obvious external forces applied. Samsung made a device with insufficient structural integrity to support the display AND/OR with insufficient separation between the sides of the device and the internal OLED matrix. It is a design flaw. Samsung needs to reach out to their customers and resolve this issue before it turns into a class action lawsuit. I'm going to pay the $100 for "insurance" replacement under US Cellular's device protection plan. I mean, what else can I do? I can't even get a different model mobile phone without shelling out the full, non-contract, price. US Cellular offered me a $25 credit on my next bill for my troubles, which is just an insult. 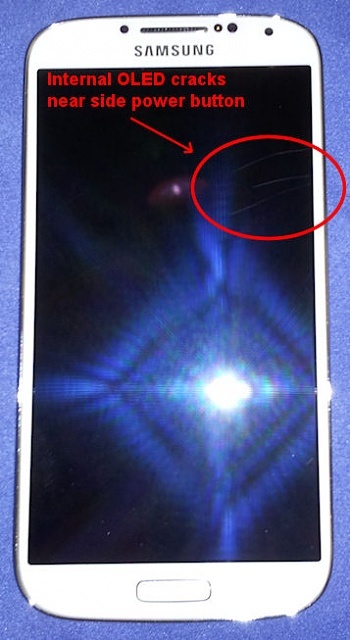 Attached are images of my Galaxy S 4 highlighting the internal cracks and what the display looked like powered on. The exact same thing happend to my Galaxsy S4 with Verizon. I did not have insurance either. After going to a repair shop, they said it would be $350 to repair, Verizon would replace the phone for up to $299, so I went to the cheaper of the two. Now that I read this, I wish i had gone to Samsung and complained to them. I've got the exact same problem and I'm absolutely gutted as you are. My phone only lasted 3 weeks tops. It's inside a otter box defender 4 case with screen protector (never removed it from purchase). The phone has never been dropped and very well look after. However I'm also a retailer that sells Samsung phones and I personally want to get to the bottom of this. The very faint crack inside my screen (3x2mm - Front top right) is located directly opposite the screw on the other side of the case. I only noticed this very faint crack when my screen battery died and the screen was black. Only then was it noticeable. I personally believe during manufacturing, the screw was placed tightly right against the screen. Due to minor vibration the screen got damaged from the inside out. I can understand there might be cases of a pressure applied to the phone to cause the damage, however I can confidently say that this is not the case. Even when pressure was applied being inside an otter box defender s4 case, i highly doubt normal amount of pressure would have caused the damage. Samsung will receive I phone call from me tomorrow. I'll keep you guys updated. I've read on various forums its design flaw or something like that. Have anyone suffered same after they got it repaired ??. I see no reason for using S4 $100 per week. I got an update on my situation. After fighting with Sprint for 2 weeks they agreed to give me a $100 credit towards my bill. So basically I will be responsible for $50 towards the insurance claim. I had to threaten to cancel my service to get them to offer me this. I hope this helps. My S4 is 4 months old, in mint condition, has never been dropped, sat on, given to my granddaughter or the dogs to play with. I was visiting my mum in hospital during the week showing her pictures of my granddaughter and put it on the bed when I had finished. As I left I picked it up and it vibrated. The screen was black and when I pushed the lock button a thin green line flashed from right to left. I noticed later that there is a hairline crack in the screen top lefthand corner. Its on the inside. I Googled this and found that LOADS of people have the same problem. I spoke to Samsung in the UK this morning. Apparently if the phone is used for a long time or you're watching videos, looking at pictures etc. the battery gets hot and expands. When that happens it puts pressure on the screen and it cracks. The first thing I was asked to do was take the battery out and see if it was thicker than normal or distorted. In my case it wasn't but the phone does get very hot if I'm on the web etc. It's going away to the repair centre and heaven help them if they try to get any money out of me. If you're dealing direct with Samsung don't take no for an answer. This is obviously a design fault. Good luck!!! calling Samsung will do nothing I have the same issue and contacted them they want 200 to fix the phone cause the issue is considered to be out of the warranty. I have googled it and it has been a issue but Samsung refuses to fix it unless you pay to fix my phone is less then 4 months old. I have always had Samsung with no problems but after the S4 I will never buy any thing with Samsung on it there customer service is really bad they want our money but don't back there products . Just had the same thing happen to me while walking from dinner at a restaurant to my vehicle. When my car's Bluetooth tried to connect to my Samsung Galaxy S4, I noticed three very fine "hairline" type cracks underneath the top layer of glass. Then I noticed what looked to be the fluid for the LCD screen seeping between layers. All this happened 18 days after I received the phone. Called Samsung and they are "unaware" of this issue as a problem; however, we even went as far as emailing them about 15 links from multiple sites where people are obviously having this issue. I called Verizon and finally spoke to a guy in Tier I customer service that was aware of this issue, then transferred to Tier II customer service where the guy there also said he was familiar with it. So far, I have them sending me a replacement phone, but I'm worried I'm going to be charged for this phone once their warehouse receives the broken one. I'll keep you posted, but I think everyone needs to let customer service everywhere know of this issue and continue to post online.